Just by plugging in this unit you can completely transform any room. The Napoleon Cinema Glass 29 Built-In Electric Fireplace does just that. Install this Electric Fireplace in to the wall for a custom look without the need for a chimney or gas fitter. Set the mood instantly with complete control over flame height, ember lights, heat intensity, and our unique NIGHT LIGHT feature. The Cinema Glass 29 Built-In Electric Fireplace sets the perfect mood, renewing any room in the house. Timeless grace. Combine the charm and elegance of yesteryear with the function of today. Historic Mantels' intricately carved Chateau Series Louis XIII Cast Stone Mantel will turn any home into your personal castle! Enhancing presence in any medium to large living room or bedroom. Affordable luxury -- enjoy the look of a custom designed mantel without designer prices. This cast stone mantel can be used around electric, gas or log burning fireplace inserts. The Chateau Series of mantels includes a 3-piece hearth in matching stone. Use the included matching filler panels or create your own original custom surround. Easy to install; a 2-person do-it-yourself project. All parts and full instructions included. The Napoleon Woodland 24 Electric Log Set is perfect for a pre-existing masonry opening. No installation required, these plug and play, hand painted logs instantly provide the ambiance of a wood or gas fire without mess or expensive installation. The authentic looking logs and ember bed mimic the glowing radiance of real burning wood fire. LED lights provide you with years of reliable use and no maintenance. The Woodland 24-inch Electric Log Set comes with an included remote giving you mastery over flame height, intensity, heating, and even the ember bed lighting. Transform your dingy old masonry opening into a beautiful and cozy fireplace with the Woodland Series by Napoleon. The Ambrosia Maple mantel is designed to bring a rustic element to any room. The faux wrought iron insert adds an element of true old world charm. Use this as a floating shelf or as a mantel above a fireplace. Ambrosia Maple wood features oblong and gray hued bores that run with the grain of the wood leaving a distinct coloration and texture. Highlight these unique elements with a clear finish or stain to match existing decor. Rustic mantel shelf, wood mounting cleat, wall screws, finish nails and instruction sheet are all included. Cinema 29-inch Built-In Electric Fireplace Insert with Glass Media Just by plugging in this unit you can completely transform any room. The Napoleon Cinema Glass 29 Built-In Electric Fireplace does just that. Install this Electric Fireplace in to the wall for a custom look without the need for a chimney or gas fitter. Set the mood instantly with complete control over flame height, ember lights, heat intensity, and our unique NIGHT LIGHT feature. The Cinema Glass 29 Built-In Electric Fireplace sets the perfect mood, renewing any room in the house. 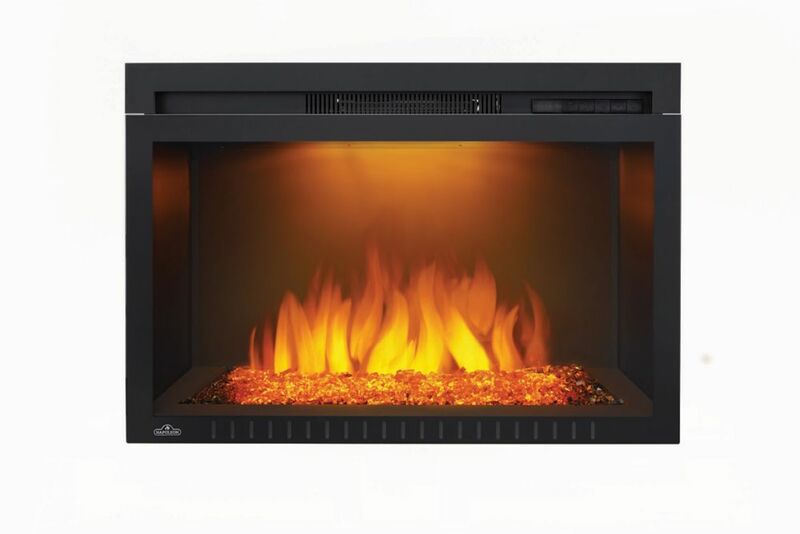 Cinema 29-inch Built-In Electric Fireplace Insert with Glass Media is rated 3.0 out of 5 by 2. Rated 5 out of 5 by smp1987 from Exactly what I wanted! We replaced a 30 year old gas insert in our master bedroom with the Napoleon Cinema 29” electric insert. It was a masonry fireplace that we have updated the exterior of over the years and I was tired of looking at the old gas insert which was more of dust collector than anything else. I wanted to improve the esthetic of the insert - which will primarily be used for ambiance and only occasionally for additional heat - and the cost of a new gas insert was prohibitive for the amount and type of use it would get. This electric insert is perfect and a much more affordable option. I did have to track down a trim kit through a different online retailer (there is one specifically for this model) as Home Depot doesn’t offer it (hint, hint Home Depot), but I love the features of this insert and chose the glass embers vs the log set for a more updated look. It provides a very cosy ambiance in the room and we use it regularly. Rated 1 out of 5 by joyhawk99 from I called the electrician to install it, and he said... I called the electrician to install it, and he said it could not be done without drilling through the wall and adding a electric fuse box to my LR. He also said it would cost about $300 per month to use. So I sent it back.